The Board is committed to a “fair share” contribution policy within an honor system, combined with transparency to our members regarding our financial status and requirements. The following guidelines are provided for both new and continuing members as they make pledges for their membership contribution. They are based on several key principles. 1. We are a mature full-service synagogue with a fully dedicated Rabbi, weekly services, cantorial soloists, a building and sanctuary, adult education and a religious school providing programs from kindergarten to high school. 2. To be accessible to as many individuals and families as possible, we do not want a rigid contribution policy that might discourage those who want to become members. We do not want to inquire into the financial circumstances of our members. At the same time, however, we need sufficient income to meet our financial obligations. So we ask members to use fair share guidelines and an honor system and to pledge as much as they can. 3. 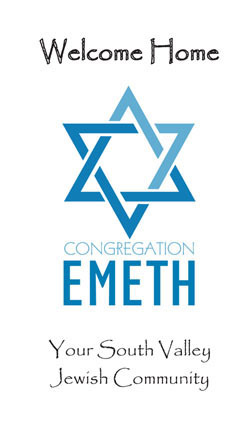 The total cost of operating Congregation Emeth is approximately $205,000 per year or about $2,800 per member household. The largest components of this include compensation for our Rabbi, loan payments and operating costs for our building, and the costs of our educational programs.Some costs of the school are covered by tuition, and other revenues come from several fundraisers and special donations throughout the year by many generous members. We also obtain rental income from several groups in the community who use our space when we do not need it, helping us pay down some of the loans we obtained in 2008 to purchase our building.After accounting for these additional sources of income we require a reliable base of income of approximately $2,100 per member household per year. Two thirds of households’ financial pledges are $1,000 to $3,000 per year. 1. Members should pledge as much as they believe they can after considering the unique and substantial value that Congregation Emeth provides as well as their own financial circumstances. 2. A survey of many synagogues shows that a common contribution level is 2% of gross household income. 3. This level of 2%, if applied to the reported average household income in the Morgan Hill–Gilroy area of $90,000 per year would result in $1,800 per household, very close to our goal. 4. Members with household incomes below this average, for example, $50,000, might aim for a figure somewhat below the 2% level, such as $800 (2% x $50,000 is $1,000). 5. Members with household incomes above this figure, for example, $175,000, might aim for a figure somewhat above the 2% level, such as $4,000 (2% x $175,000 is $3,500).